Castle Baths, online at castlebaths.com, specializes in creating natural organic spa products for skin and bath with therapeutic aromatherapy and botany ingredients. The result are natural, pure, made to order, as fresh as possible, completely vegan - well, with the exception of the 3 goats milk soap bars, and never tested on animals bath products created with certified organic and wild crafted ingredients. You'll find a great selection of Dead Sea products, body moisturizers, pure essential oils, face treatments, foot care products, massage oils, baths salts, body washes, soaps and mists. Plus beautiful gift baskets and body care for your pet. Visit 58coupons for the best Castle Baths promotions, savings and discounts. 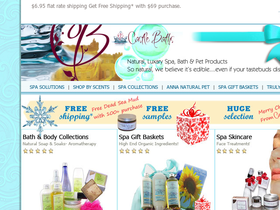 Enjoy $5.50 flat rate shipping on all orders from Castle Baths. Follow this link to start shopping. Sign up and earn spa points with every purchase from Castle Baths and you'll receive a $5 credit for every $250 you spend. Click link and join today. Try before you buy. Visit Castle Baths and order free sampels of their best selling products. Click link to begin. Visit Castle Baths today and save up to 30% on select spa and bath gift sets. Click link to see the selection.